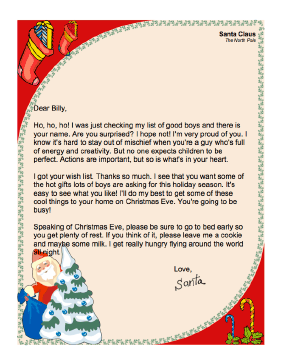 This printable letter from Santa Claus to a little boy thanks him for his letter and Santa promises to do his best to grant the boy's Christmas gift wishes. Ho, ho, ho! I was just checking my list of good boys and there is your name. Are you surprised? I hope not! I'm very proud of you. I know it's hard to stay out of mischief when you're a guy who's full of energy and creativity. But no one expects children to be perfect. Actions are important, but so is what's in your heart. I got your wish list. Thanks so much. I see that you want some of the hot gifts lots of boys are asking for this holiday season. It's easy to see what you like! I'll do my best to get some of these cool things to your home on Christmas Eve. You're going to be busy! Speaking of Christmas Eve, please be sure to go to bed early so you get plenty of rest. If you think of it, please leave me a cookie and maybe some milk. I get really hungry flying around the world all night.